Looks pretty swell, no? It comes out on March 4th, as the first in Disney’s Artist Showcase series, in which they’ve paired brilliant Disney artists and animators with children’s book authors. (You can pre-order copies online or through your local indie.) I’m thrilled to be a part of this program, and I loved every minute of the bookmaking process. And Lorelay Bové’s artwork is sweet and funny and retro-cool, and reminds me of one of my very favorite artists, Mary Blair. It’s such an honor to have my words brought to life by Lorelay’s amazing images! Making this book was a different experience for me, as I was given samples of Lorelay’s characters and the premise of table manners and wrote my story to her specifications. Usually it’s the other way around, with artists receiving the text and creating illustrations to complement it. But as you know, I love a challenge, and this was a fun one. I channeled my own experiences with family members (who shall remain nameless!) with less-than-perfect table manners, and memories of the time my mother signed me and my sister up for an after-school class called Little Miss Hostess (honestly, I think it was her way of getting us out of her hair for a couple of hours a week). The class was held at our local community center, and showed us how to set a table and how to prepare and serve delicacies such as tuna melts and Waldorf salad. With such a wealth of inspiration, it didn’t take too long for my story of Evie and Simon and their bumbling father to take shape. I didn’t want the text to feel like a preachy-teachy lesson, so it seemed more fun to give the kids impeccable table manners and make their father the one who could use some polish. 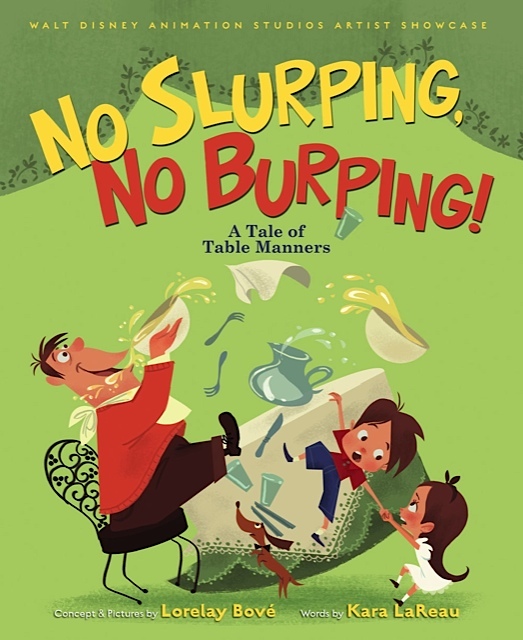 The book has already been reviewed by Publishers Weekly, which called it a “fun role-reversal story,” and by Kirkus, which said, “Parents hoping to instill good behavior in their own offspring will clamor for this title, and LaReau’s light touch makes it pleasant to read.” Not too shabby! I can’t wait to do some signings and appearances this spring; I’ll keep you posted as plans are confirmed. And if you’re a bookstore, school, library, or other cool venue and you’re interested in inviting me to chat about books and table manners, drop me a line! Congrats! I’ll have to make some orders for some spring gifts.